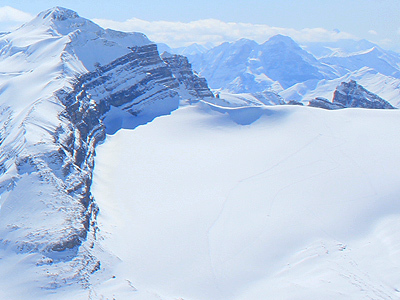 The Balfour Hut is the third hut on the Wapta Traverse which is a classic Canadian ski traverse located in the heart of the Rockies just outside Lake Louise Alberta. There are four huts along the way to make the journey more enjoyable — the Peyto Hut, the Bow Hut, the Balfour Hut and the Scott Duncan Hut. Backcountry skiing and ski mountaineering objectives around Balfour Hut are glacier based so you need good white out navigation skills and crevasse rescue skills. Within a short ski tour you can access Mt. Olive, Mt. Balfour, Mt. Gordon and of course the Diableret Glacier. The Diableret Glacier is a long gentle glacier located to the west of the Balfour Hut that will make any skier look good. There are typically few crevasses to navigate and the up track can be gentle and direct to the top. From the Balfour Hut head due West through the Balfour Pass a little over a kilometer then start trending south and gaining elevation. You will soon be on the Diableret Glacier with the west ridge of Mt. Balfour in sight and the starting point for your ski down. Only a few switch backs are required near the top of the glacier where things get steeper, you will also want to avoid the left side where it gets very steep and full of crevasses, instead take the gentle ramp to the right that is the most efficient climb. From the top of the Diableret Glacier switch over to ski mode and enjoy a 1000 foot descent that is gentle and seemingly never ending. To get back to the Balfour Hut simply retrace your tracks. Be prepared for white out conditions as the weather can come in fast and with out any features to guide you by it is very easy to get disoriented out here. ACCESS: From Balfour Hut on the Wapta Traverse.